as Civil and Electrical Engineers. So engineering Graduates who are waiting for a job can apply for these posts as a Trainee on Contract Basis. Surely it will be a great experience for your future career path. Interested Candidate should apply between 16/08/2016. The Selected Candidate can be placed for Job all over India. For further more details like Age Limitations, Vacancy Reservations, Pay Scale, Contract Period, Selection and Application Procedure please read the full information below. The Candidate should not cross the upper age of 27 years as on 30/06/2016. The Age relaxation depends on the category of the candidates. 3.For PWD (Gen) Candidates the upper age bar is to be maximum of 10 years. 4.For PWD (OBC) is 13 years and PWD(SC/ST) is 15 years. There are 25 vacancies in the Water and Power Consultancy Services Limited. 1. 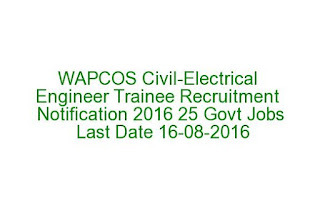 For Engineer Trainee (Civil) 20 vacancies are allotted. 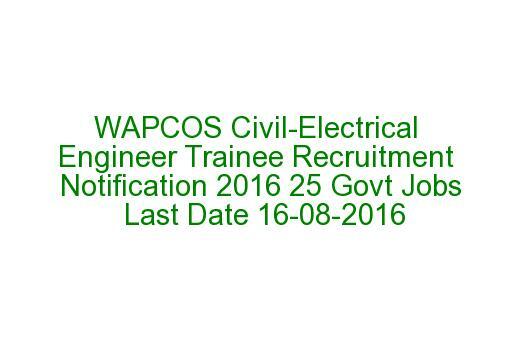 2.The remaining 05 vacancies is for Engineer Trainee (Electrical). 1. The Candidate should finish his/her B.E./ B.Tech Degree either in the Civil or Electrical Stream from a recognized Institute/University. 2.The Candidate should be an Indian Citizen and should be within the prescribed age limit. The Selection Committee can do the selection criteria for the above to stages of selection depends on the no. of vacancies, applications received and candidates shortlisted. The Written Exam will be of Objective Type Questions. Candidates shortlisted in this only will be called for Group Discussion. The selected candidates will be required to execute a service agreement bond. For GEN/OBC The amount of bond is Rs.1,00,000/- and Rs.50,000/-in case of SC/ST/PWD candidates.